Working out with hand weights while walking may offer more risks than benefits. While adding hand weights to aerobic activities can increase energy expenditure, it can also cause injuries. There are alternatives to hand weights that provide a safer resistance training element to your walking routine. If you do use hand weights while walking, take extreme caution to reduce injury risk. According to the American Council on Exercise, using 1- to 3-pound hand weights while engaging in aerobic activity like walking can boost your heart rate by five to 10 beats per minute and increase oxygen consumption 5 to 15 percent. This increased energy expenditure can help you burn more calories. If you are short on exercise time, combining aerobic and strength-training elements into one workout is convenient. Using hand weights during aerobic activity can cause stress injuries to your arm muscles and joints. Your shoulders and upper chest muscles are also more prone to injury. Carrying hand weights that are too heavy can impair your normal arm swing and create muscle soreness and damage. And, the combination of hand weights and walking can trigger an abnormal spike in blood pressure, according to a study published in 1987 in the journal “Medicine and Science in Sports and Exercise.” While increasing your injury risk, incorporating hand weights into aerobic activity may be ineffective. According to a study published in 2002 in the "Journal of Sports Medicine and Physical Fitness,” there was no benefit in using hand or ankle weights when performing step aerobics. If you are determined to use hand weights while walking, use them with extreme caution. The University of California at Berkeley's School of Public Health recommends beginning with 1-pound weights and increasing the weight gradually as your strength and endurance builds, not exceeding weights that are more than 10 percent of your body weight. The American Council on Exercise recommends a maximum of 3 pounds for hand weights. Wrist weights are considered to be safer than hand weights because they are worn and not held tightly in the hand; therefore, they don’t cause a sharp rise in blood pressure. 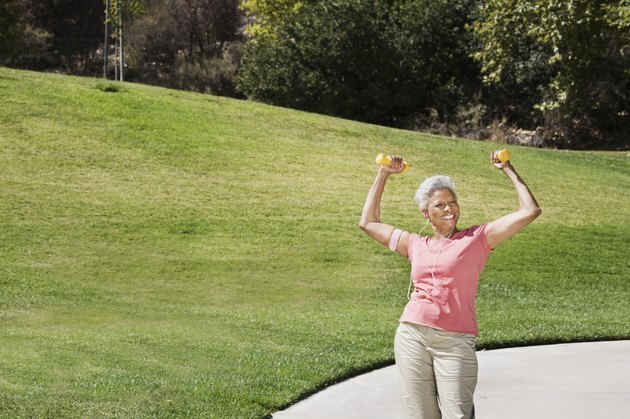 You don’t need hand weights to tone your arms while walking. Simply forming a fist and incorporating exercises like lateral presses, chest presses and upright rows helps sculpt upper-body muscles. If you want to carry something in your hands while walking, consider walking poles, which mimic the physical action involved in cross-country skiing. Walking poles work your chest, arm and abdominal muscles. Using these walking tools can increase the number of calories burned while not increasing your injury risk the way hand weights do. A weighted vest is another safer alternative to hand weights. To gain calorie-burning benefits, it should weigh about 20 percent more than your body weight. Journal of Sports Medicine and Physical Fitness: Bench/Step Training With and Without Extremity Loading. Effects on Muscular Fitness, Body Composition Profile, and Psychological Affect.